I have visited perhaps two dozen or more cathedrals, churches, chapels and monasteries in Crete during my three-week holiday. They have ranged in size and importance from tiny chapels on off-shore islands to busy city-centre cathedrals, to side-by-side chapels in a large monastery that has just one resident monk-priest. Almost all of these have been Greek Orthodox churches. Every city has its cathedral, every suburb and every village has its own parish church and its own resident parish priest, and the road signs remind you that you are always within comfortable walking distance of a monastery or a convent, in the mountains and in the cities. Each Sunday morning, I have attending the Divine Liturgy in one of the two small, local parish churches in suburban Platanes or at Saint Nectarios in the neighbouring village of Tsesmes, on the road up to Arkadi Monastery in the mountains. 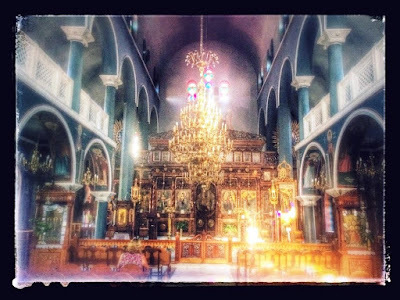 The Orthodox liturgy starts early on Sunday mornings in Greece, so that it had ended each Sunday and I was back for breakfast before many people back home had even started to wake up. Although the majority of Greeks see their Orthodox belonging as an essential ingredient in their national and cultural identity, Church attendance figures on Sunday mornings are surprisingly low, with high numbers among those who are middle-aged or older. Many people only come to church for the occasions of baptisms, weddings and funerals, for the major Church holidays and local festivals, and to mark their name day. Often people in the resorts try to forestall any questions by explaining that they need to open their shops, restaurants and hotel reception desks early on Sunday mornings. Young parents often come with their recently baptised children so that they can receive the Eucharist, but even then they usually arrive late, just in time for the child to receive Communion, and they rarely take Communion themselves. Even regular churchgoers are casual about their own attendance and participation in the Liturgy. They greet one another with hugs and kisses, constantly chatter away, and they leave it to the cantors to chant the responses and those parts that Anglicnas would always want to join in at, such as the Gloria, Creed, Trisagion (Sanctus and Benedictus) and the Lord’s Prayer. Few people ever receive communion on a Sunday morning – apart from the children brought by their parents, there may only be four or five communicants in any church. Yet everyone knows what is going on and follows in their own reverential ways. There is silence and reverence at the most appropriate times, including the Gospel procession and reading, the invocation of the Holy Spirit (epiclesis) and words of institution, the Creed and Lord’s Prayer, and when others come forward to receive the Sacrament. No-one comes into a church without lighting candles and kissing the main icons. Intermittently, people come forward to the side doors of the icon screen to pass pieces of paper on to the priest with the names of people they want prayed for. There is much incense … and much ringing of bells. The prósphoron (πρόσφορον) or loaf of bread used in the Divine Liturgy is made of two separate round pieces of leavened dough placed one on top of the other and baked together to form a single loaf. This double-loaf represents the two natures of Christ, human and divine. Before baking, each prósphoron is stamped with a special seal bearing, among other things, the image of the cross with the Greek letters IC XC NIKA (‘Jesus Christ conquers’) around the arms of the cross. This impression is baked into the bread and serves as a guide for the priest when is cutting it. The Communion is received as bread and wine mixed together in one large chalice and administered with a long, ladle-like spoon. The antídoron (αντίδωρον) is ordinary bread that that comes from the remains of the prósphoron and is blessed but not consecrated. This bread is distributed to all at the end of the Liturgy, and many people take small portions home to family members who have not been to church. The reverential but casual approach to church-going and participation in the Liturgy is sometimes reflected in the liturgical style of priests. Many of the prayers are left to the cantors, while the cantors are singing the equivalent of hymns the priest may continue with the Liturgy in a tone that we would regard as mumbling, and during the intercessions they may often begin the next prayer before the cantor has finished singing the responses to the previous prayer. The modern liturgical movement has drawn many insights from Orthodox Liturgy, such as a full set of Biblical readings, the Gospel procession and the Offertory procession, and the general understanding that liturgy is the work of the people and work for the people. This word liturgy is well-understood by everyone in Greece. The term is not technical or purely theological. Signs in shops regularly announce ‘Opening Hours’ as ώρες λειτουργίας (ores leitourgías) – the hours of service or the hours for serving the public. But the Liturgy in churches often takes place behind the icon screen, sometimes with the doors closed, and even when the doors of the screen are opened, the priest usually has his back to the people. In most churches, there is only a nominal or notional assent to the concepts of the Gospel procession and the Offertory procession, with the priest carrying the Gospel or the gifts of bread and white out through the doors on the north side of the icon screen, and back in through the central doors. I have seldom seen them brought down and in among the people, and the Gospel is usually read from the steps of the screen rather than being proclaimed from among the people. Indeed, there is usually only one reading, and the sermon at the end seldom lasts for more than three to five minutes. On the other hand, in the midst of this relaxed formality, priests never abandon the liturgical tradition or vary it to suit their own personal preferences, prejudices r impulses. The variety or chaos, choose which you will, that is experienced throughout Anglicanism on a Sunday morning, is not possible in the Greek Orthodox Church, not that it would ever be contemplated. Of course, I can understand most if not all that happens, and it hurts not to be able to receive the Sacrament, although I have if any differences with Orthodox doctrines, beliefs and theological systems. During these three weeks, I also visited the Church of Saint Anthony of Padua, the Roman Catholic Church run by the Franciscans in the heart of the old city of Rethymnon, and I have attended Mass there in the past. Sadly I have yet to visit the one Anglican church in Crete. On the other hand, I recently visited an Evangelical church in one town in Crete, long after the Sunday liturgy I had attended was over. There are a number of evangelical churches in Crete, so I am not going to assume that they are all like this, nor am I going to assume that my one Sunday experience there was typical of that church in particular. But my experience was less than happy, to say the least, and disturbing at many points. There was no Gospel reading, no confession and absolution, no mention of God’s forgiveness, no creedal statement of faith, no Lord’s Prayer. There was time for “fellowship,” when people turned their chairs around, chatted socially with one another, and tried to uncover whether the new visitor was “saved.” The hymns often came three-in-a-row, without any connection one to another, and without any connection to the one reading or to the theme of a 25-minute rambling talk that was supposed to be the sermon and that would have benefitted from greater preparation. The prayers were unstructured and informal, and they made no mention of the town we were in, of local issues and concerns, of the wider world, and – and this is disturbing in Greece – made no reference to the plight of refugees in Greece and the present economic crisis that is devastating the country. Needless to say, there was no Sacrament, or even a mention of when the Eucharist or Lord’s Supper was going to be celebrated in the Sundays to come. There was no Trinitarian formula at any stage; all references to God were to “the Father,” while Christ was always referred to as Jesus, as if he was a buddy but never the Second Person of the Holy Trinity; surprisingly, for a church that had hints of being open to Charismatic approaches, I heard no mention of the Holy Spirit at any time that morning. I came away feeling I had met a very nice collection of friends who knew one another, and had genuine concern for each other. But I did not come away with a feeling that I had been to church. I have not named this church, nor have I said which town it is in. They were warm-hearted, genuine, friendly and welcoming people. But I wonder what their mission goals are and why they think they are here, for what purpose and for what mission. On the other hand, the Greek Orthodox Church has sometimes been criticised unfairly for lacking a sense of mission, and the Pan-Orthodox Council, officially, which met last month [June 2016] at the Orthodox Academy of Crete, in Kolymbari, west of Chania, brought into the open many of the internal divisions within the wider Orthodox family. Yet the doors of local churches throughout Greece are open throughout the day, Greeks constantly drop in without any self-consciousness to pray, to light a candle, to stand in the presence of God. The domes above are a constant reminder that the world below is under Christ’s constant and compassionate love. It is a Church that is incarnational and rooted in the everyday lives of the people. On Sundays, even for the visitor who cannot understand Greek, it is obvious that the Gospel is being proclaimed, that people are being invited into communion with God and with one another, and that God is being praised. Orthodoxy in the first instance means not holding a particular set of dogmas or doctrines – certainly not holding to a rigid set of prejudices in current debates – but in giving God the right praise. I strive on holidays like this to go to my nearest church, choosing not to go to a church that suits my taste and my prejudices, for then I am in danger of seeking to worship a god in my image and likeness rather than being called back to being in the image and likeness of the God who has made me andconstantly assures me of his love. I have always found a warm welcome in Orthodox churches, and my experiences of the Orthodox Church seem, somehow, to confirm and strengthen my Anglicanism, perhaps even make me a happier and a more committed Anglican. Visiting this evangelical church did so too, but for very different reasons.